What should we expect of our men (or women) partners today? Flowers, chocolate, high fives, blah blah.... For all of the fun of a day dedicated to sparkly, heart-shaped, pink and white everything, I find Valentine’s day rather empty -- despite that I have a valentine whom I love oh so very much. I don't want to spend money, or have money spent on me, for the sake of a tradition that tells us we should. If anything, I would like to use Valentines Day as a yearly reminder to be more loving, kind, and thoughtful throughout the year. A reminder to write more love poems for my lover, friends, family; to find romance in the little things; to treat each other with compassion and love daily; to spread the gift of love to those suffering in this world. So, perhaps today, instead of buying chocolates (what am I saying?!) or jewelry or fancy dinners for our sweethearts, we could buy a flower for someone who badly needs some affection or donate to a small charity for to pay love forward. My friend Kayde trekked through snow and ice to get to my house yesterday, and she brought the most precious gift with her: a bag a raw cocoa beans! An acquaintance gifted it to her as a birthday present, and she didn't quite know quite what to do with them. As is to be expected. 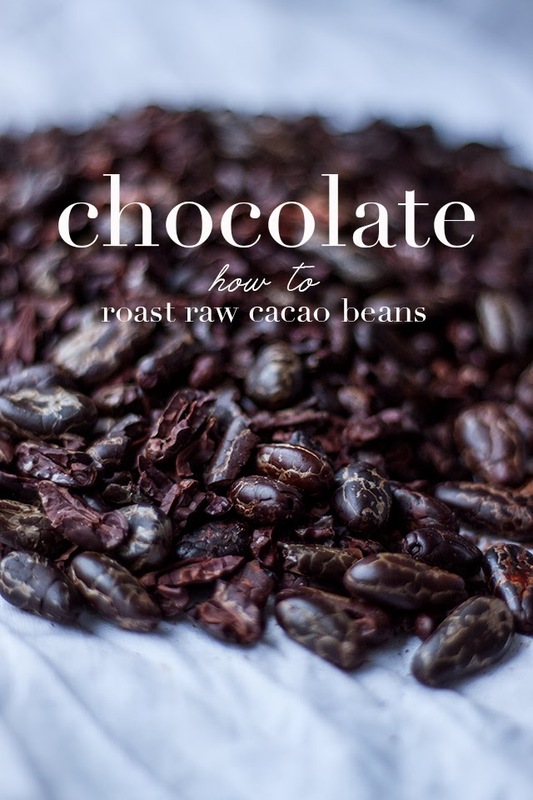 Raw cocoa beans are precious and nutritious, but also waxy and bland. Difficult to work with, if you're going to work with them at all. You have to roast them to 1. bring out their fantastic aromatic flavor qualities, and 2. get the crunch typical of cacao nibs you buy in stores. We have a fancy cocoa bean roaster in our chocolate test kitchen (yes, that's a real thing), but you can roast raw beans at home in a cast iron skillet or on a cookie sheet in the oven. Lay 1 LB of your raw beans out on your cookie sheet. Check through your beans to make sure there is no detritus (you find some crazy things in raw bean stock sometimes...). Spread out your beans evenly, and place on the middle rack in your oven. Roast for 10 minutes, stirring once half way through. Your cocoa beans are done roasting when your kitchen starts smelling strongly of fresh brownies. Remove from oven immediately and let cool 10 minutes (it's great if you have a small fan at this point to help with cooling). Once cooled, shell the beans with your hands by gently gripping and twisting them between your fingers. The shells are papery and light, and should twist off rather easily (especially if you have criollo stock i.e. smaller, fine flavor beans). Discard the shells (or you can save them and use them to steep for a chocolate tea). Crush the beans gently with your hands to break the beans into nibs. Store in an airtight container. They keep for 3 years!